First, it would block the efforts of local communities in Maine, Utah, Arizona, and elsewhere, which have been asking President Obama to establish new national monuments in their states. Though Rep. Gosar argues that the bill prevents local voices from being ignored, in both of the above cases there is strong local support for these national monuments. Seventy-one percent of Utah voters declared their support for a Bears Ears monument and the same percentage of Nevadans support the protection of Gold Butte. The bill would also block a grassroots call to protect the Grand Canyon from uranium mining, the expansion of which would fall in Rep. Gosar’s district. The petition to protect the area has recently reached more than half a million signatures. Congressman Stewart`s proposal seeks to carve out an area of the country where only some laws apply, said Jennifer Rokala of the Center for Western Priorities. By first proposing to strip U.S. land management agencies of their law enforcement powers and now taking away the president`s authority to protect public lands, it seems that some members of Congress are trying to establish a Republic of Cliven Bundy in the West. What a recklessly bad idea. In March, Congressman Jason Chaffetz (R-UT) introduced legislation, co-sponsored by Reps. Stewart and Gosar, which would abolish the authority of the Bureau of Land Management (BLM) and Forest Service to perform law enforcement duties on U.S. public lands. Instead, the bill transfers law enforcement powers to local county sheriffs, fulfilling one of the demands of the Bundy gang and other anti-government extremists who believe sheriffs are constitutionally endowed with more power than the federal government. This bill is yet another in a series of bills put forth by the 20-member Congressional Anti-Parks caucus in the U.S. Congress, of which both Stewart and Gosar are part. The caucus has been responsible for fanning the flames of the Bundy land seizure agenda, blocking new conservation laws, and introducing legislation aimed at weakening protections of lands that are owned by all Americans. 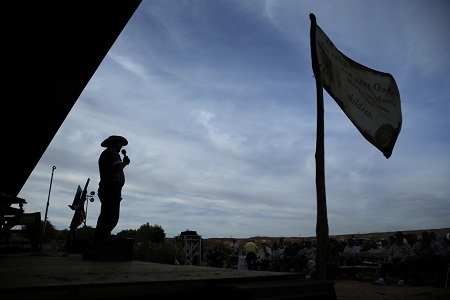 Photo: Ammon Bundy, son of rancher Cliven Bundy, speaks at an event Friday, 10 April 2015, in Bunkerville, Nevada. Source: John Locher/AP. Note: Cliven D. Bundy is a U.S. cattle rancher from Bunkerville, Nevada who advocates a philosophy opposed to what he calls “federal government overreach.” He is known for instigating an armed standoff in Nevada with federal and state law enforcement while asserting a claim to grazing rights on public land. Some view him as a hero for leading a movement of ranchers and other disaffected populations to avoid paying for use of public land, while others consider him dangerously provocative. He is the father of Ammon Bundy, who in 2016 initiated an armed occupation of the Malheur National Wildlife Refuge in Oregon. On February 10, 2016, Cliven Bundy was arrested by the Federal Bureau of Investigation (FBI) at the Portland International Airport while he was on his way to support the Malheur occupation. He faces federal charges related to his own standoff with the Bureau of Land Management in 2014. His trial is scheduled for 2017.